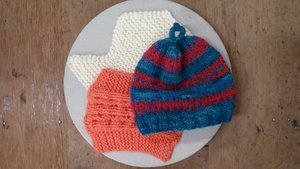 Move beyond your basic knitting skills as you learn to increase, decrease, cable, knit in the round, and start a project of your own choosing. The first week,you will learn directional increases and decreases and how to twist cable right and left. In the second session, you will learn to knit in the round on two circular needles and work a small Fair Isle pattern. In the last class, you will choose a pattern you want to knit. You will learn the value of gauge and some knitting tips and tricks for success.